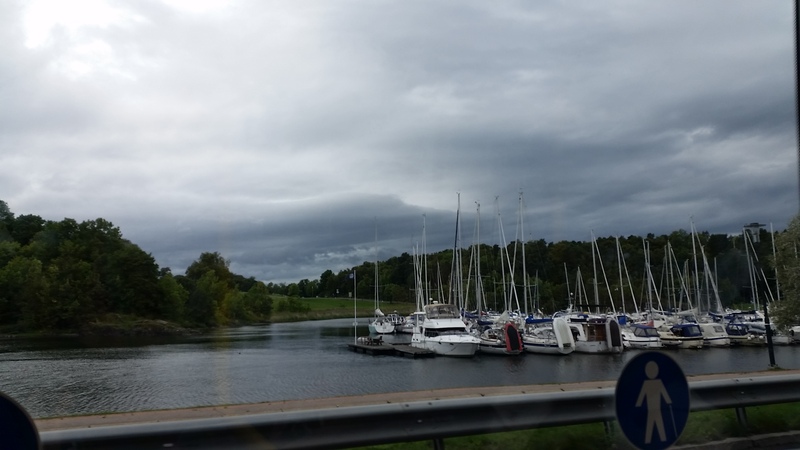 Must do in Oslo: a trip to Ikea! My mother-in-law is arriving soon and, although the sun now sets at a reasonable 8.30pm time, it still rises quite early so we had to get block out curtains for the guest room. What’s a better family adventure than a trip to Ikea? Slependen is the first Ikea they opened in Oslo, it’s south of the city center and near the coast. Furuset seems to be much bigger but I’ve been told the warehouse was across the street which can make it quite inconvenient, especially on a rainy day like last Saturday. 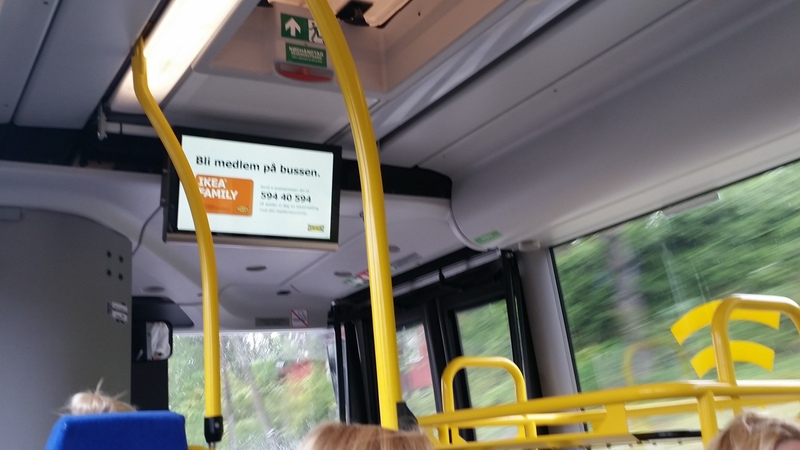 There are FREE shuttle buses from Oslo city center to a choice of two destinations: Ikea Furuset and Ikea Slependen. We picked one based on the shuttle schedule: as we arrived at 11.15 at the station, it made sense to take the Slependen one. Every hour, lives the city at half past and lives Ikea at 10 past. What wasn’t so good is that people don’t give time for passenger to get off the bus before they rush in. 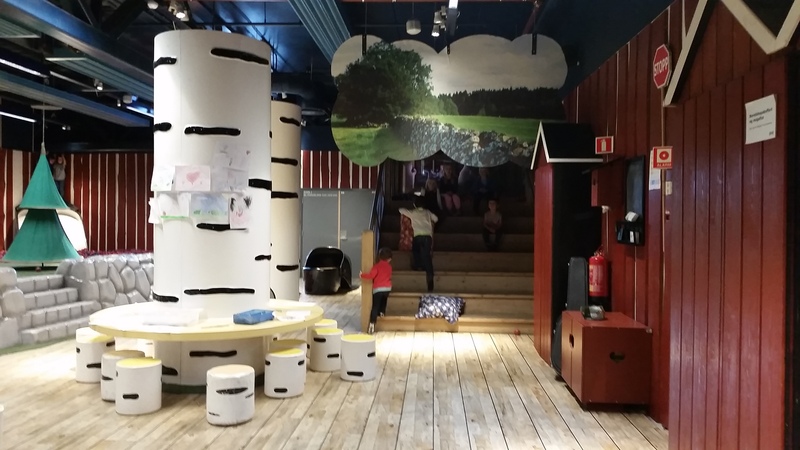 We couldn’t miss Småland and the opportunity to offload the kids at Ikea’s famous playground so we could shop freely while the kids are having fun. WIN WIN situation! The kids saw the massive screen playing The Croods and the ball pool, no need to convince them they’ll have a good time. However, when we arrived at 11.45am. Småland was full so we had to wait for some kids to exit before we could go in. We were second in the queue. It was quite frustrating as we could see many kids being picked up but the ladies running the playground were too slow to let the kids in in between the picks ups, which resulted in a good 20 minute wait! Argh! I’m learning that it’s “Norwegian service” just like at Trancher restaurant last time…See how empty it was when our kids finally got in! 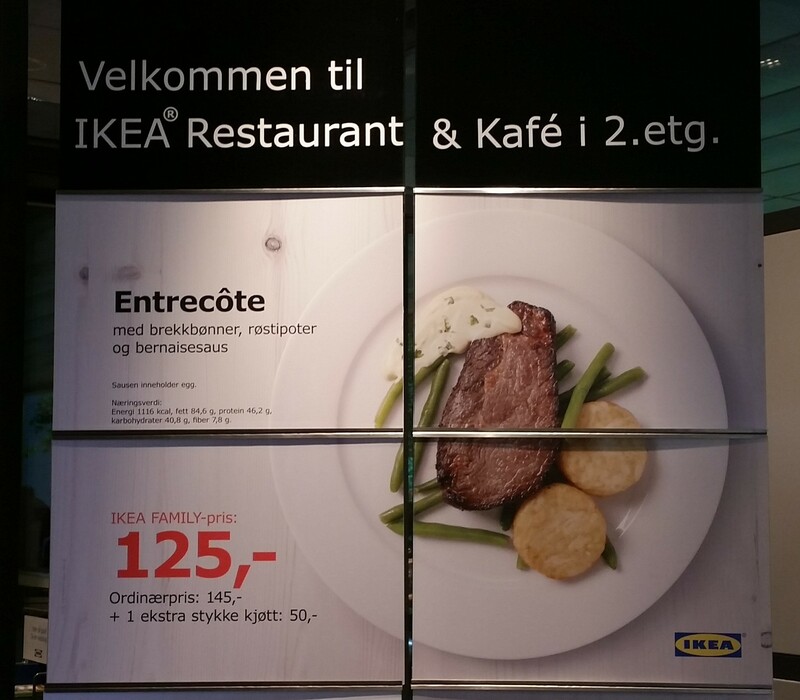 I’ve been to a couple of Ikea near Paris, in Sydney area and in Zürich. All were packed on Saturdays: lots of people in the way, you get too hot, it gets noisy and husband get even more pissed off and grumbles and mumbles “I told you so, let’s get out of here as quickly as possible”. Funny I got comments on Facebook like “why on earth are you going to Ikea on a Saturday?”. But here, it was spacious and it didn’t feel crowded at all. It was almost enjoyable! And as it wasn’t too big, we didn’t feel we were wasting a lot of time going through their maze when we knew exactly what we were after. After we bought lots of stuff including a small side table with a tray, candles etc… we felt like trying their restaurant. But what to do with all our shopping? 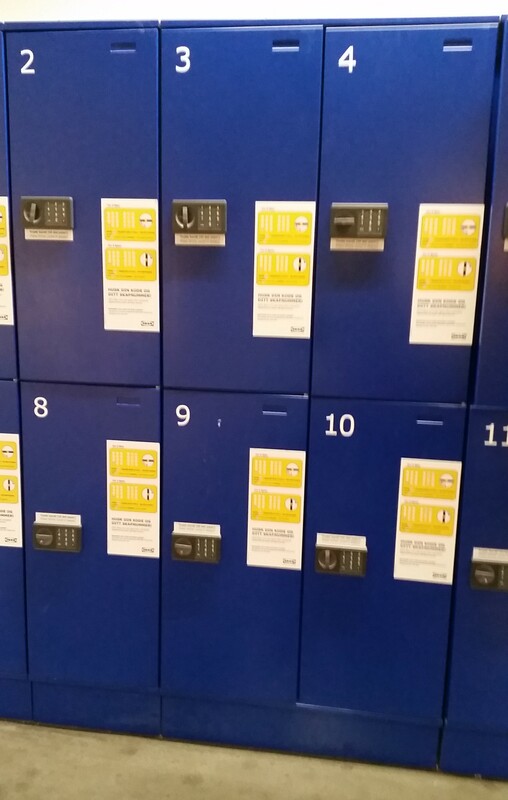 There were FREE lockers! We shove all our stuff in there, got the kids out, took them to the clean spacious bathroom to wahs their hand and off to lunch! 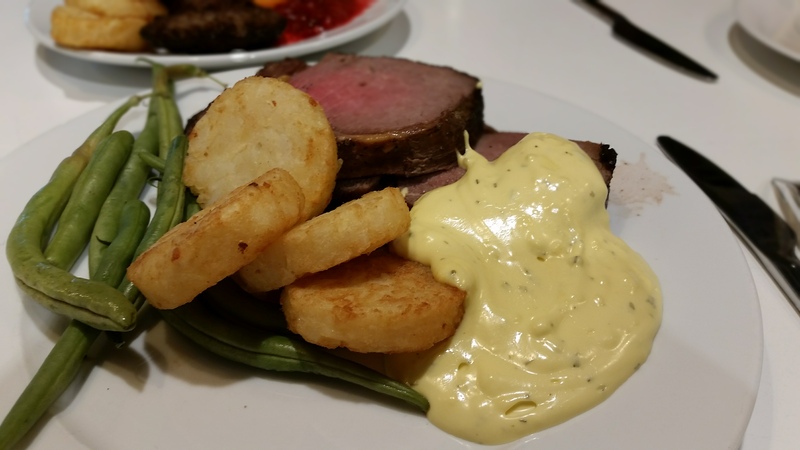 Now look at what I got served… would you like some food with your Bearnaise sauce? It was a total of 400 Kr for the 4 of us including dessert and ice tea. But the quality wasn’t there, the veggies were not fresh, the entrecote was roasted and not grilled, the top of the creme brulée had all melted. Only the salmon was ok. Not sure I’d go back. What’s YOUR Ikea experience, wherever you are in the world (and bought the same shower curtain or bed sheets as us)?